Conveniently located just a 2-minute drive from Dubai International Airport, this International 4-star business class hotel features 4 restaurants and 3 bars, an outdoor swimming pool and a gym . The modern rooms are soundproofed and include a seating area.The well designed rooms at the Millennium Dubai Airport Hotel are decorated in warm colors. They have satellite TV and a private bathroom with toiletries.Guests of the Millennium Airport Hotel can enjoy an eclectic mix of dining and entertainment options: authentic Italian cuisine at Da Vinci’s Italian Trattoria, traditional British fare and watch live sports at Biggles Pub, Tex-Mex food & Latino music at Cactus Jacks, amazing selection of grills at the DXB Grill or our international buffet (all day dining) at Loumi restaurant.For recreational purposes, guests can have a swim or cool down with some drinks at the Oasis Pool & Bar. 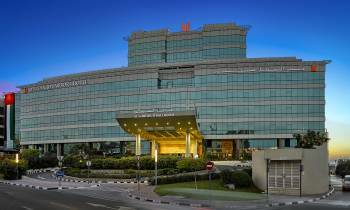 Guests can enjoy the on-site shops or room service.The hotel is situated near GGICO Dubai Metro Station. It is also within easy reach to Deira City Center Shopping Mall, Dubai Festival City, Gold Souq and Dubai Heritage Village and other major business districts and tourist attractions. Our Al Garhoud Ballroom with an indoor sitting capacity of up to 400 guests & outdoor poolside garden area with up to 250 guests. It has a direct access from main road with its own private private entrance.The hotel also features 7 unique meeting rooms ranging from 38 to 83sqm, and equipped with the latest audiovisual facilities, light sensor, and Wi-Fi. For those who prefer an outdoor venue, we have various landscaped patios, terraces, and gardens which are perfect for outdoor dining, pre-event drinks, and cocktail parties for up to 250 guests.